This strategy explores the role of designers in promoting sustainability and change. Theorist suggest that as we now live in a society in which “everybody designs” they have to work as part of a “complex mesh”- among individuals, non-profit organisations and businesses who are working creatively towards sustainability. This quote outlines the idea that designers should not only produce things, but also promote their ideals. 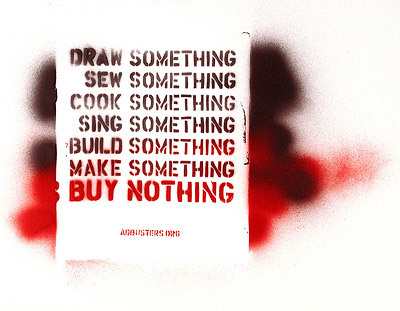 AdBusters are a very prolific group of designers that have been participating in design activism for many years. The first piece that I came across of theirs was actually in the Victoria and Albert Museum- “I shop therefore I am”. Often, the designers take adverts or phrases and twist them slightly to reveal a new truth. The pieces are quite subtle but very clever, and have a lasting effect of the viewer. They take something that we know so well and make us realise there is a lot more to think about. This particular campaign worked against mass consumerism and needless consumption. I think having a kind of personal manifesto to work by, being confident in this manifesto and believing in it, sharing it with others so that they might adopt the approaches themselves is a way that I could be slightly more of a design activist. This lecture made me realise that activism does’t have to be aggressive or vigorous, but can make a big difference.